Henry's law states that the amount of a gas that dissolves in a liquid is directly proportional to the partial pressure of that gas. William Henry (Chemist) studied and formulated this subject in the early 19th century. In his publication, he explained his research and results. The law is given above. Below is the video that explains the law. For this formula, the temperature should be constant. What is Henry's Law used for? This law is one of the gas laws in Chemistry formulated in the early 19th century. 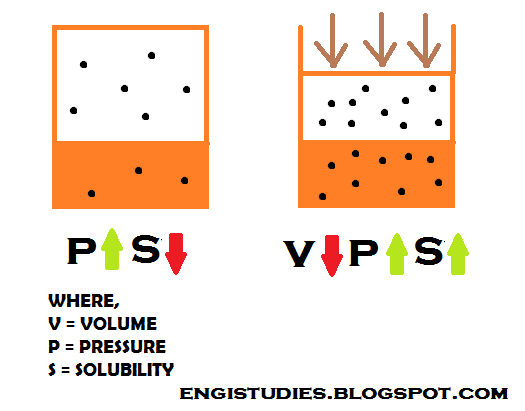 If the temperature is kept constant and pressure increased then volume decreases and liquid 'captures' the gas molecules. The vice-versa is also true. We can observe this in our daily life. Take a cold drink and shake it without opening the cap. Now when you open the cap slowly the gas trapped inside will try to escape. This gas is nothing but the Carbon Dioxide present in the bottle. By shaking we increased the pressure and the gas molecules get into the liquid solution.